Saguaro Cactus - How Do You Pronounce It? The saguaro cactus is a very unusual looking tree of the desert. It has been the subject of many photographs, and commonly conjures up thoughts of the old west and the beauty of the Southwest desert. Along with each saguaro cactus picture, I've included a saguaro fact. Now you can be a saguaro expert! Saguaro is an Indian word. The correct pronunciation is "sah-wah-ro" or "suh-wah-ro." The formal name is Carnegiea gigantea. It was named for Andrew Carnegie. About the spelling — you might see an alternate spelling: sahuaro. That is not the official spelling, although everyone will understand to what you refer. You'll also see that alternate spelling used in various businesses, schools and organizations. Does a Saguaro Have Flowers? The state flower of Arizona is the saguaro cactus flower. Don't jump to conclusions though — the saguaro cactus is NOT the state tree of Arizona. And by the way, the plural of cactus is cacti (cac-tie) not cactuses, although this 'new' word seems to be popping up more often and gaining in acceptability. Where Does the Saguaro Cactus Grow? The saguaro is found only in the Sonoran Desert, which includes about 120,000 square miles of California and Arizona. Most of Baja California and half of the state of Sonora, Mexico is also included. You won't find saguaros above an elevation of about 3,500 feet since they can't handle much frost. Can a saguaro cactus really be grown from seeds in a pot? Yes, you can purchase seeds from various gift shops around town. If you care for it properly, it will grow. The issue is, you probably won't be around long enough to watch it get very tall. How Many Arms Does a Saguaro Have? A saguaro's arms usually begin to grow only after it is about 15 feet tall and around 75 years old. Despite what some may say, there is no limit to the number of arms a Saguaro can grow. Saguaro Cactus — Where Did Those Holes Come From? A saguaro with many holes in it has been visited by the Gila Woodpecker. The bird will drill several holes to get to the water stored inside. The saguaro seals off the hole with scar tissue to prevent water loss. Saguaro Cactus — How Tall Are Saguaros? The average saguaro has about five arms and is about 30 feet tall. According to the National Park Service, the tallest saguaro that we know about was 78 feet tall. That saguaro cactus was probably well over 200 years old. How Big Are The Biggest Saguaros? The tallest saguaros are about 200 years old. They have more than 50 arms. 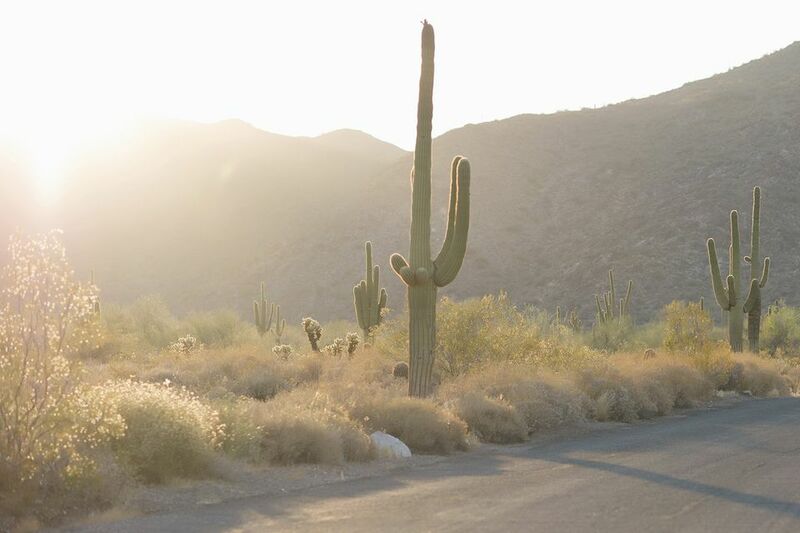 Saguaros can grow to over 50 feet tall, but they are not the largest in the world. There are about 50 varieties of tree-like cacti found in the desert and some of them in Mexico and South America are even taller than the saguaro. How Does a Saguaro Store Water? The outside skin of the saguaro is smooth. Inside the full-grown saguaro there are two-inch spines, giving the saguaro the pleated effect that you see from the outside. Those pleats allow the saguaro to expand as it absorbs water. A saguaro can hold about a ton of water. How Deep Are a Saguaro's Roots? The root system of a saguaro is very shallow. There is a tap root that is only about three feet long. Smaller roots are longer, radiating out and adding stability to the saguaro by wrapping themselves around rocks. When Does the Saguaro Flower Bloom? The saguaro flowers once every year, typically in May and June. Not all the saguaro cactus flowers bloom at the same time; several per day will bloom over the period of a few weeks. Saguaro blooms open at night and last through the next midday. Over a period of about a month, a few of the flowers open each night. They secrete a very sweet nectar into the flower tubes. Each flower blooms only once. How Big is the Saguaro Cactus Flower? The saguaro flower is about a three-inch-wide cluster of creamy white petals around a dense group of yellow stamens on about a four-inch-long stem. The saguaro has more stamens per flower than any other cactus flower. How Does Pollination of a Saguaro Cactus Take Place? A saguaro can only be fertilized by pollen from another cactus. The pollen attracts birds, bats, and insects which go from saguaro to saguaro to enjoy the sweet nectar. If fertilization has taken place, a fruit will begin to form at the base of the flower. What Happens to the Saguaro Cactus Fruit? The ripe fruit is about three inches wide and eventually splits open. A single fruit can have thousands of seeds. All sorts of desert creatures feed on the fruit of the saguaro, and if any seeds survive, a new saguaro may be created. Do Birds Live in Saguaros? Gila Woodpeckers and Gilded Flickers are common inhabitants of saguaros. Owls, martins, and finches may also visit from time to time. Hawks will sometimes nest in the saguaro from which they can easily see their prey below. The saguaro is threatened by several factors. Lightning and root rot during the rainy season can be deadly to a saguaro. Humans use them for target practice and urban sprawl continues to move them, and their pollinators, from their native habitat. Still, there is no evidence to suggest that saguaros are declining in number. Even so, you can't just go out into the desert and dig one up to take home with you. It is illegal. You must have a permit to do so. Beware of individuals selling saguaros. If they can't produce a permit, please don't purchase it. What Happens When a Saguaro Dies? Trees die, and so do saguaros. The fleshy parts of the tree decay or are eaten by animals. The skeleton of the saguaro is all that will remain. Planting a Saguaro Cactus. It's Not Like Planting a Geranium.